Despite the art offerings of Film Streams and the mainstream fare of locally owened theaters like Aksarben, Nebraska still isn’t the ideal place to be a film lover. Sure, we get to see the big studio films the same day as the rest of the country, but independent and foreign films on limited release schedules can take months to make their way into the area. Side note: the Dundee reopening can’t get here fast enough… So if Nebraska is hard enough on film lovers, that also means it’s a rigorous environment for local filmmakers who are trying to get their work seen. 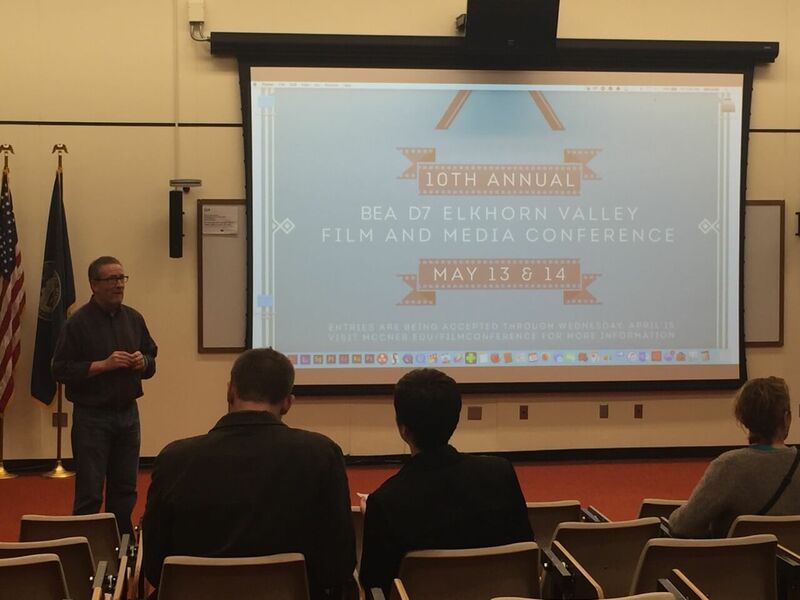 The Elkhorn Valley/BEA D7 Film and Media Conference at the Metropolitan Community College (MCC) is one of the few avenues in Nebraska for aspiring local filmmakers to hone their craft and show their work to local audiences. Bob Maass, a professor at MCC, introduced the conference as an opportunity for young local filmmakers producing work that doesn’t quite fit at other film festivals; experimental short films, music videos, and the like. The film I saw at the first night of the conference was totally indicative of the conference’s goals. Stenography, written and directed by local artist Lee Murray, is an experimental dark comedy about a fictionalized meeting between two polar-opposite revolutionary leaders in Munich, Germany, shortly after the end of World War One. Because of Nazis, we know that both leaders’ revolutions eventually failed, but the artful exploration of what a meeting between the two leaders might have looked like is undeniably intriguing. Murray’s decidedly poetic representation of actual historical circumstances is divisive, but it’s the kind of divisive that inspires genuinely interesting conversations. Look…if you don’t like Stenography, then you simply don’t like experimental films. Experimental films can be hit or miss, depending on how clever they are, and Stenography is about as clever as experimental films come. At 61-minutes, Stenography is the perfect film for the Elkhorn Valley/BEA D7 Film and Media Conference, because it’s either too long or too short for most film festivals, and its content is so jarring that I wonder if other film festivals would even know what to make of it. Filmed and edited over a period of two years, mostly in front of a green screen, Stenography—perhaps unintentionally—feels like a comic book come to life. Murray presents imagery that looks more like comic book panels than any film that ever went out of its way to look like comic panels, such as 2005’s Sin City. Few of the visuals are wasted, as Murray is smart enough to take advantage of films quintessential element. My screening of Stenography was accompanied by a brief question and answer session with Murrary, followed by other short films directed by local artists—many attend high schools and colleges in the Omaha area. Admittedly, it’s hard for me not to be charmed by films produced in our filmmaking desert. Please visit the conference when it comes around next year. It’s a valuable opportunity to see stories told through the Nebraskan gaze. Your gaze.